One of Tamiya’s latest re-releases is this kit of the ill-fated M6OA2 “Starship”. In the late 1960’s with the cancellation of the very expensive MBT70 a less expensive alternative was to update the current front line tank with the high technology that had come out of the MBT70 development. This new technology was jammed into the M6OA2. It was fielded in Germany starting with the 3rd Armored Division starting in the early 1970s. 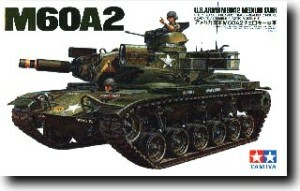 About the same time Tamiya released this kit. It is based on their venerable M6OAl kit (ca.1970, according to the copyright on the mold) with the M6OA2 following in 1972. This new re-release features new instructions and the molds have been cleaned up a bit from the older release, probably a result of the kit being made at Tamiya’s new plant in the Philippines. The model is identical to Tamiya’s other M60’s with the exceptions of two sprues for the different turret the ‘A2 sported and that this kit retains the older chevron vinyl track. The massive gaps in the rear of the hull and the motorization holes are all still here and the many omissions of Tamiya’s M60 series are all here as well. The kit is also missing the prominent bulge on the rear under the grilles of the closed breach scavenger system (CBSS), the model providing two little bulged pieces to place over the transmission access plates. However, with some good references in hand the missing details can be added and the CBSS built up with putty and a unique kit can be built from it. As far as I am concerned it is very welcome as at least it is not World War II German.